Albér BDSi is designed specifically for factory integration into Liebert UPS battery cabinets. The data center monitoring system provides detailed battery information, allowing for cost savings by optimizing useful battery life. Instead of waiting for an inevitable failure or replacing batteries prematurely to prevent problems, you can continue to utilize your batteries longer and with confidence by knowing their true internal condition. 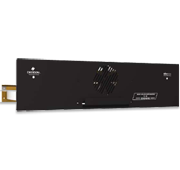 The Albér BDSi is factory integrated into Liebert UPS battery cabinets and uses custom cables with each connection point identified to the specific battery. Each Albér BDSi unit will monitor all the batteries in one cabinet, up to 40 cells. The system consists of a controller and data collector/load module units: The Albér BDSi Controller stores the data, provides alarms, power and communication connections collected by the DCM/LM unit. Each battery cabinet in the system uses the Albér BDSi DCM/LM unit, which collects and transfers data to Controller. A Controller can communicate with up to six DCM/LM units. Battery monitoring may also be managed by Liebert Services, ensuring proper, timely maintenance by local, factory-trained Customer Engineers. Windows-based software for real-time viewing, automatic data collection, data analysis, and report generating. Industry standard MODBUS protocol interfaces to third party building management systems via RS232/USB and Ethernet. Optional TCP/IP interface for network or Internet communication via MODBUS or SNMP. Scans pertinent battery parameters every 4 seconds, including total voltage, cell voltage, current and temperature. Automatic proactive internal DC resistance tests. Discharges are automatically detected and data saved for retrieval. Trend analysis provides the ability to analyze performance and aid in trouble shooting. Maintenance by the Liebert Services local, factory-trained Customer Engineers promotes proper operation and longer service life for UPS and batteries. Each system is factory installed and comes complete with the necessary custom length cables to monitor your battery. Optimizes useful battery life — Instead of waiting for an inevitable failure or replacing batteries prematurely to prevent problems, you can continue to utilize your batteries longer and with confidence by knowing their true internal condition.